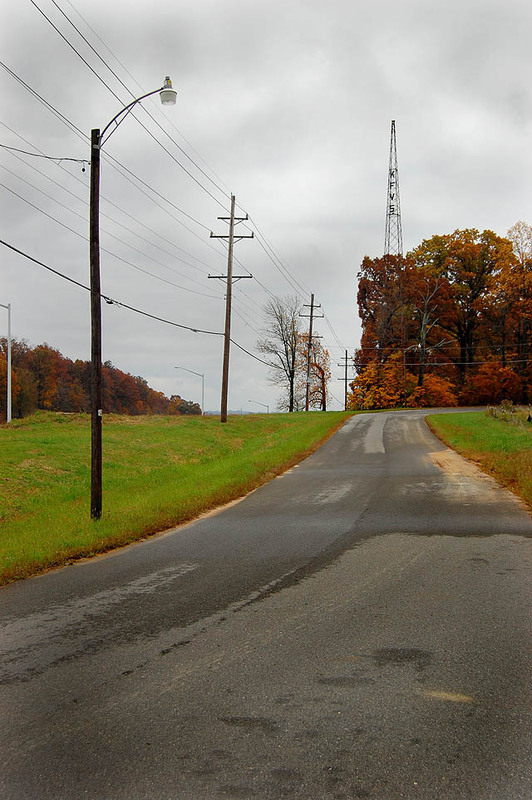 Reader William Pollack added a new dimension to the story with his comment: The tower featured on this page is one of the two original KFVS radio towers when located on Highway 61 North. They were used until 1947 when KFVS switched from 1400AM to 960AM with towers and transmitters located in East Cape. The original TV tower (’54-’60) was located directly north and across the street from the radio tower pictured. There was also a twin tower to the radio which was later moved and still stands behind the TV studio station location at 310-325 Broadway. I vaguely remembered seeing a mast behind the TV station, but never paid any attention. William is right. It’s still there. The tall concrete structrure in the background is the KFVS office building. Here’s what the view from the 11th floor looks like. Reader Tim Brown noted “Just noticed that Google Earth has updated the photo of the tower. Much clearer. Do I see an observation deck of sorts up there? Looks like a platform with railing…” It’s quite an impressive shot. Zoom in tighter to see what he’s talking about. I wonder who owns the old KFVS radio tower at the top of the page? It would be nice if it could be preserved as an example of the region’s history. That’s cool, never knew that.. Guessing downtown one is maintained better!? A friend of mine has been on the platform of the tower. He said it was a rickety ride in the lift but the view was awesome. There use to be a building south of the 61 tower that had a lot of old electronic equipment in it like a radio or tv station. 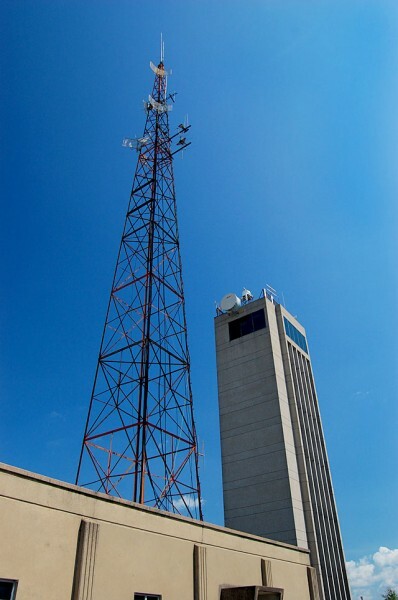 Did that use to be associated with KFVS or the tower? Richard’s memory serves him right. There was a small red brick transmitter building just south of the remaining radio tower on 61 North. It was originally used to house KFVS Radio transmission equipment (1925-1947). According to Don McNeely, electrical transcriptions (records) were played by an engineer from the transmitter location while the announcer was located in the downtown studio. The announcer would ring an old fashioned telephone crank ringing a bell at the transmitter indicating to the engineer to fade down the music to allow him to program from downtown. As a kid, I remember riding my bike out to that little building. It was full of great memorabilia…old pictures of performers, equipment, transmitters. Sometime in the mid to 70’s, it was torn down and everything hauled off. I have to admit I was devastated nothing from the early years of KFVS Radio was saved from that building. Richard’s memory serves him well. There was a small red brick transmitter building just south of the remaining radio tower on 61 North. It was originally used to house KFVS Radio transmission equipment (1925-1947). According to Don McNeely, electrical transcriptions (records) were played by an engineer from the transmitter location while the announcer was located in the downtown studio. The announcer would ring an old fashioned telephone crank ringing a bell at the transmitter indicating to the engineer to fade down the music to allow him to program from downtown. As a kid, I remember riding my bike out to that little building. It was full of great memorabilia…old pictures of performers, equipment, transmitters. Sometime in the mid to 70’s, it was torn down and everything hauled off. I have to admit I was devastated nothing from the early years of KFVS Radio was saved from that building.